With manufacturers and retailers all vying to find a place in the e-space, companies are quickly learning to serve customers through multiple channels, using multiple distribution structures and different strategies for fulfillment services. Why is fulfillment so important? Fulfillment centers allow e-commerce companies to outsource their warehousing and shipping operations warehouses to professional fulfillment service providers and establish agreed upon performance standards to satisfy customer requirements. This offers e-commerce company management the opportunity to concentrate on the bigger picture without worrying about the fulfillment of customer orders. In many cases, it is also faster, cheaper and easier to outsource your fulfillment to the experts. But is there a master strategy for managing all fulfillment? There are several challenges that one faces when dealing with multi-channel internet retailers and traditional retailers as they have different demand drivers. 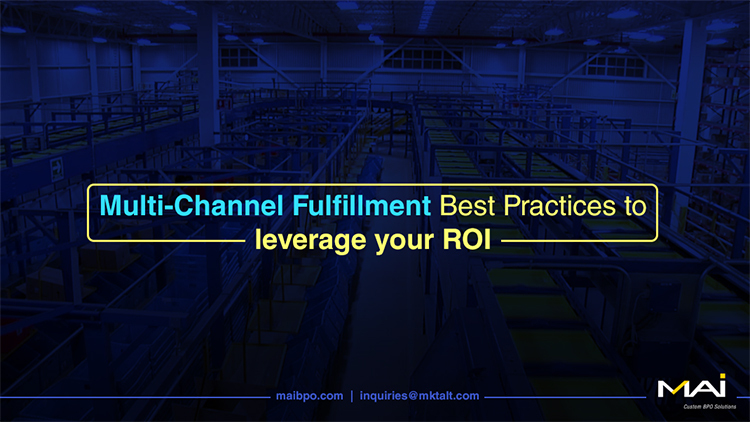 When you are looking at multi-channel fulfillment, there are several factors that will be encountered such as excess warehouse space, surplus inventory, trouble with data management, etc. These issues arise because companies do not have the perfect strategy for multi-channel fulfillment yet. Inventory – Are agents able to resolve customer issues on the first call without having to escalate, transfer or revert? This KPI is intended to measure efficiency of solving issues in the shortest span of time. Average Wait Time – Create a master inventory for all channels. This is an important step in building an effective management system. Your sales team should be able to forecast the approximate requirement of products for each channel, based on the analysis of previous data. When you decide to outsource fulfillment, make sure your business process outsourcing partner (BPO) has the resources to meet requirements specific to your business and can provide on time support for the multi-channel business that you are running. Infrastructure – Your fulfillment partner should have a good distribution network throughout the country, if they have to reach out to your customers situated in various locations. But a good fulfilment partner having multiple facilities should centrally manage its distribution network, and be well-versed with all client accounts. An ideal fulfillment partner conducts a monthly best practice conference call between the distribution centers to share and discuss internal best practices. A warehouse area can be compartmentalized into various regions such as pick-and-pack area, common bulk replenishment area, return to vendor area, etc. This reduces freight costs and allows you to have an effective and efficient management system. Information – Regardless of the number of channels that you operate, maintain a single information portal to manage all inventory across all channels. It is important that you encourage your fulfillment partner to do the same in order to leverage your ROI. It makes management of inventory; locating products and tracking discrepancies a lot easier. By using a single information system, you will also gain nationwide visibility which is an added bonus! At the end of the day, supreme customer satisfaction is the key to the success of your company. When you decide to outsource your multi-channel fulfillment requirements, ensure that you research your prospective partner well. Incorporate the best practices in order to have an efficient inventory management system, data management system and flawless customer service. The rise of multi-channel retail has led to increase in the challenges and opportunities in this industry. The ones who are able to overcome these obstacles succeed in their business. MAI follows the best strategic fulfillment practices in the industry. Those who realize fulfillment is a powerful secret weapon, and outsource their fulfilment requirements to partners like MAI, can concentrate on the growth of their business and surpass the competition.